A piece of reused brown paper with a small sample of layered fabrics stretched and folded and stitched to the brown paper. 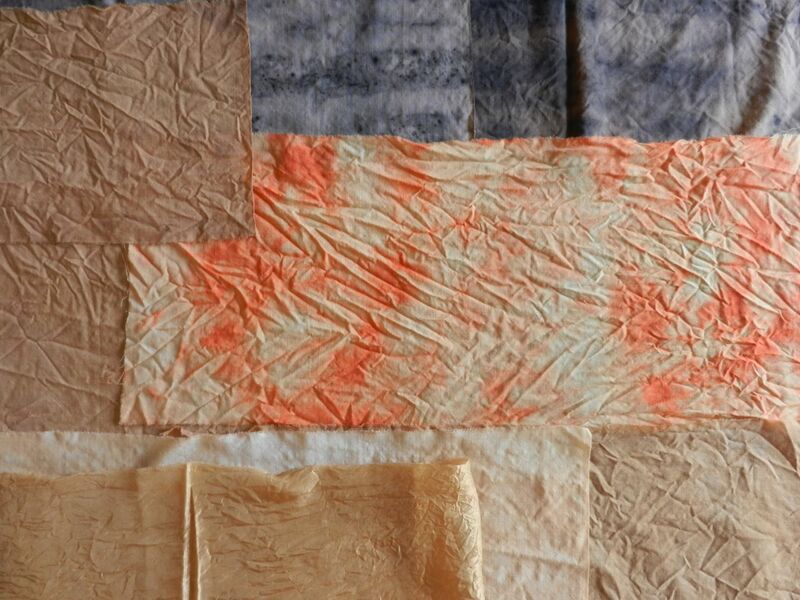 The fabrics are dull shades of green, brown, pink and blue. Image description: Two postcards blutacked to an old tea towel with the text ‘I am not a racist b’ stitched into the cloth between the postcards. The upper postcard is a reproduction of a painting by Bella Kelly, Noongar elder and founder of the Carrolup school of painting. Her painting depicts the Stirling Ranges, which were the centre of the land in the SW of Western Australia stolen from her people by the English invaders. The lower postcard is a photo of metal security mesh, with a red rectangle drawn onto the image to highlight a bullet hole in the mesh. The photo was taken clandestinely by one of the refugees imprisoned in the former Lombrun detention centre on Manus Island, PNG. It was taken after the Good Friday 2017 shooting when drunk navy and security officers fired more than 100 bullets into the compound where more than 1000 men were kept locked up by Australia. A sheaf of papers lies on a wooden desk. The top sheet has personal writing about grief and memory found on Instagram and an academic reflection on a book titled ‘Vibrant Matter’. 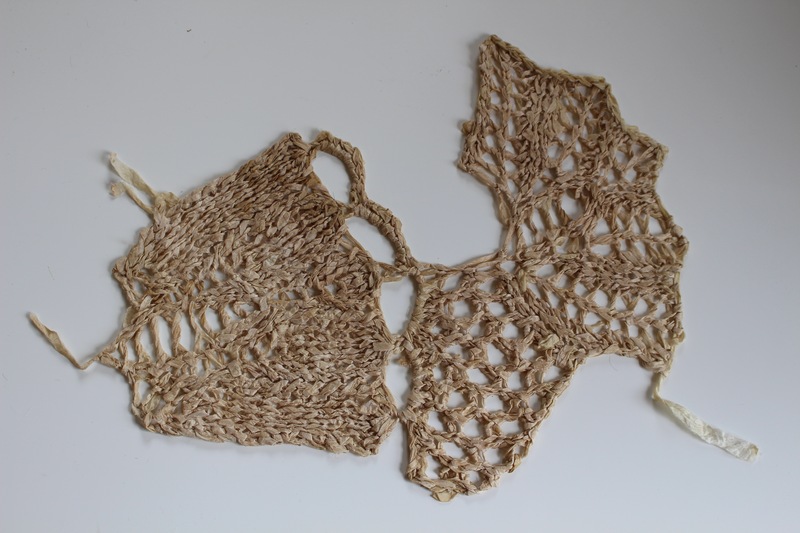 Lying on the papers is a piece of partially completed crochet, with the wooden hook attached. Also attached is the rest of the ball of yarn which is made of many shorter lengths of hand spun yarn that had been worked and presented as part of the graduation exhibition of the maker, seven and a half years ago. Yesterday’s piece of handspun handcrocheted cloth was unraveled and remade, using up the whole ball of ‘calendar’ spinning. October 2011 recurs in April 2019. Image description: Lying on a crumpled piece of white paper is a crumpled piece of woolly handmade cloth bound roughly with red thread. 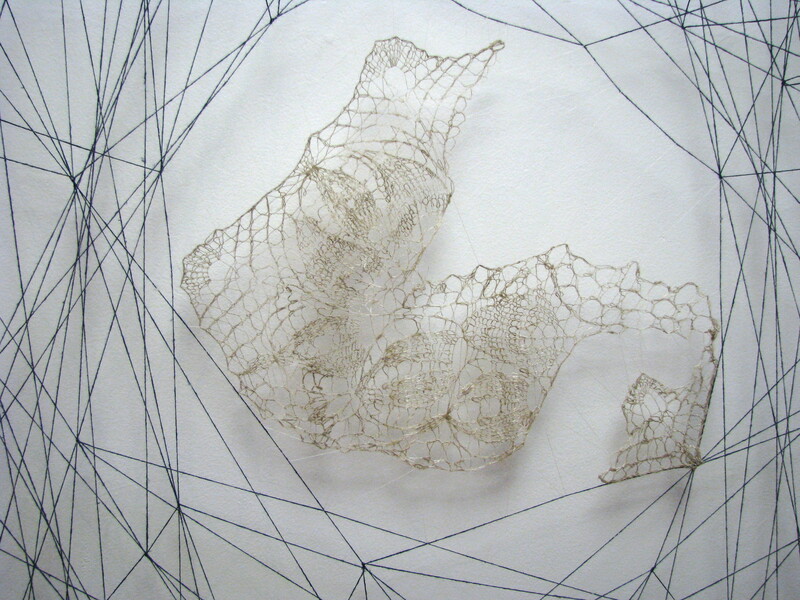 Image description: close up of pieces of lace, torn paper and frayed pink blanket which are layered on each other to have their edges parallel and offset. A pink thread from the blanket extends and penetrates one of the small orifices in a woody seed head from a casuarina. 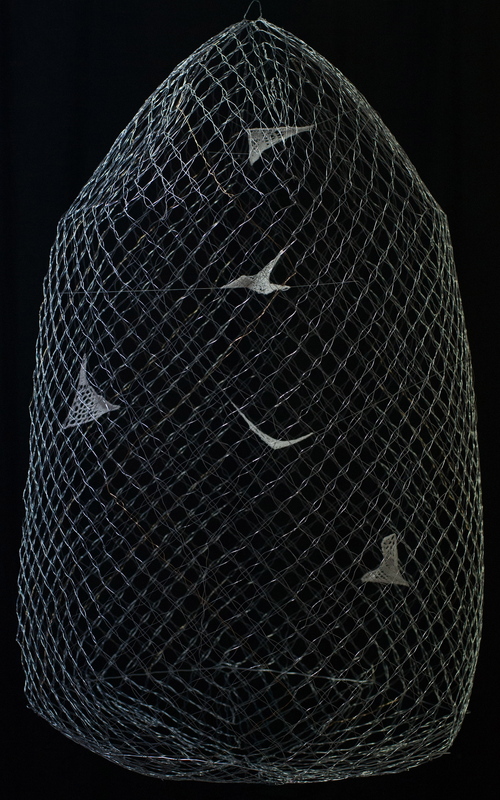 Shadows from the frayed edge and the seed head are cast on the background paper. Every April since 2014 12ø collective has hosted a month-long project where participants make and submit a new artwork each day of the month. This is my first year to join in. Check out 12ø collective website to see all (!) the submitted artworks. 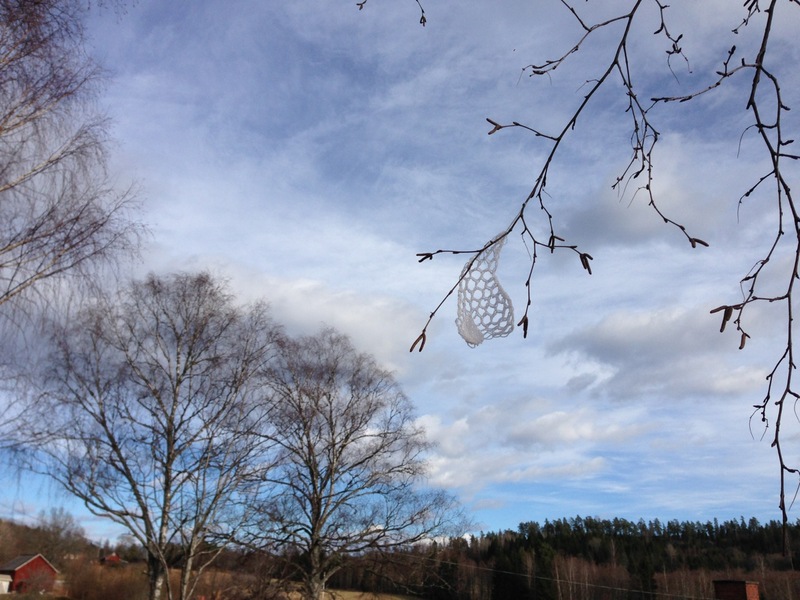 I keep coming back to fragments of knit lace retrieved from Herbert Niebling charts. Or they keep coming back to me. 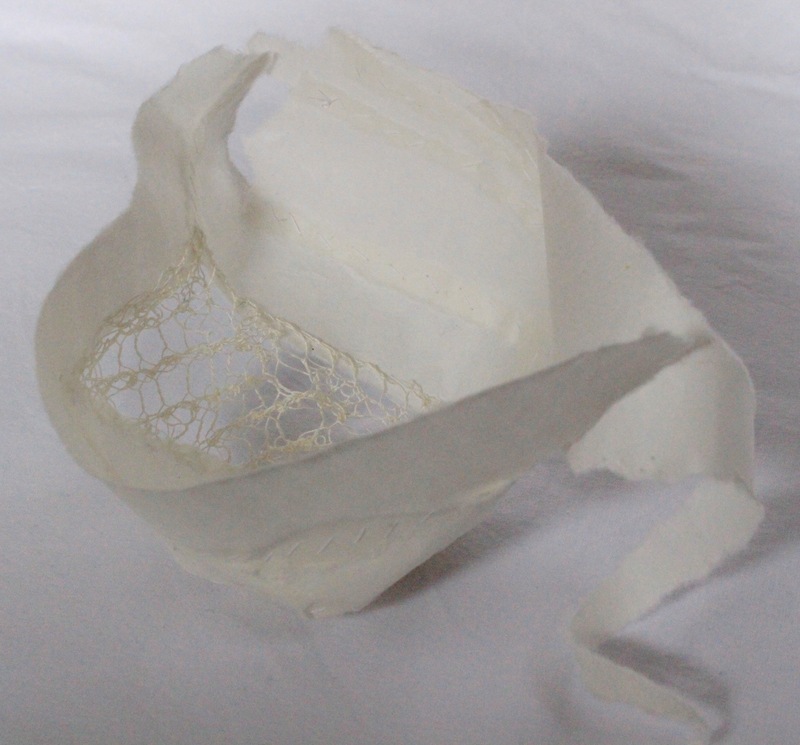 Lately, reconsidered in crochet cotton, with mulberry paper. I had intended, months ago, to write about the process of making the Beverley map, to summarise my residency experience and then show the work in Perth as a conclusion to the experience. and, perhaps influenced by the gliders circling overhead, decided to take an aerial perspective and piece a fabric map of the town site. 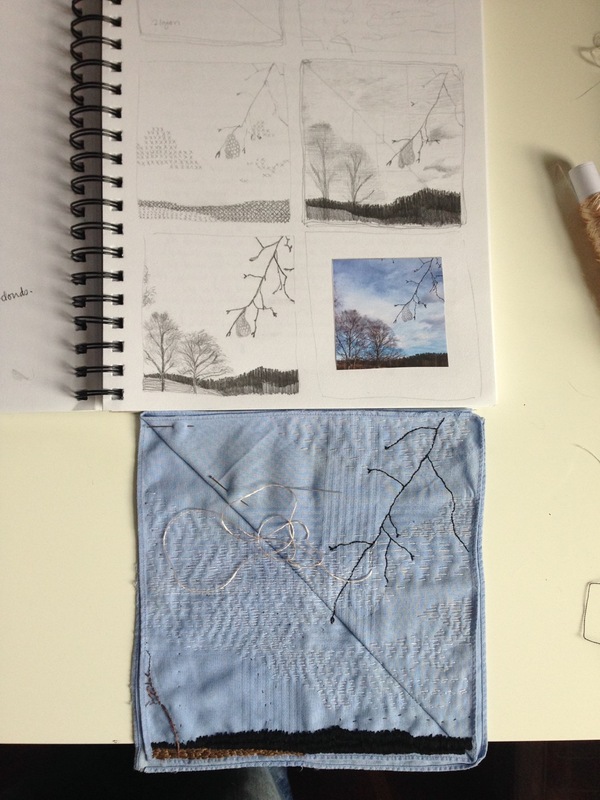 Sensations that arose while making the pieced map extended beyond cutting and stitching the fabric to my experience of the physicality of moving across the land. I felt the rounded curves of the rolling hills as I shaped the pieces to curve into each other. Faint odour of plant-dyed fabric recalled walks under gum trees, bark crunching underfoot. I joined the pieces with vertical black stitches so that the seams stood up like fence lines. The last stitches went in on the final morning. 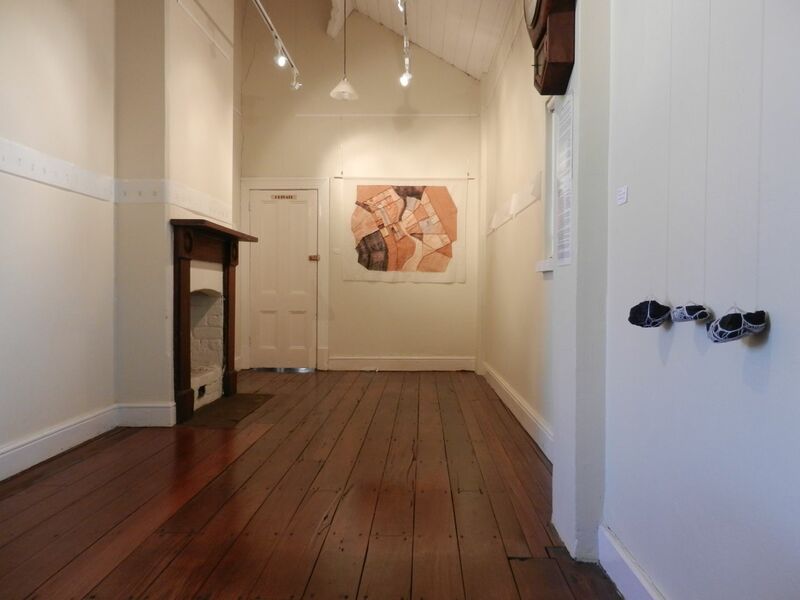 In the gallery I noticed that the Beverley locals who looked at my work saw their familiar town with fresh eyes. Back in Perth, I felt unable to call the Beverley map ‘finished’. 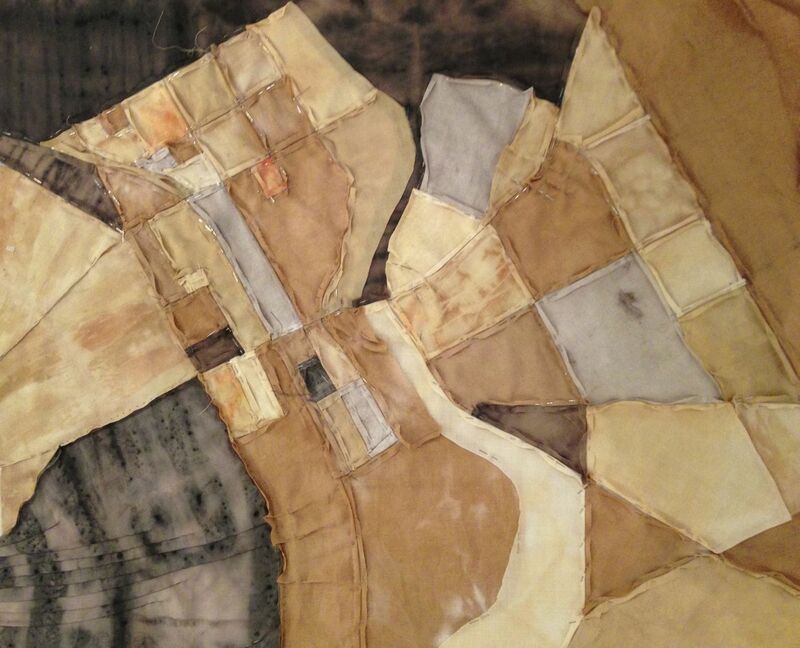 There was more to it than representing a town map in dyed fabric. In Ground Truthing Paul Carter writes about what a map reveals and conceals, how language, memory and being on-the-ground both enrich and contradict the impression from the air. 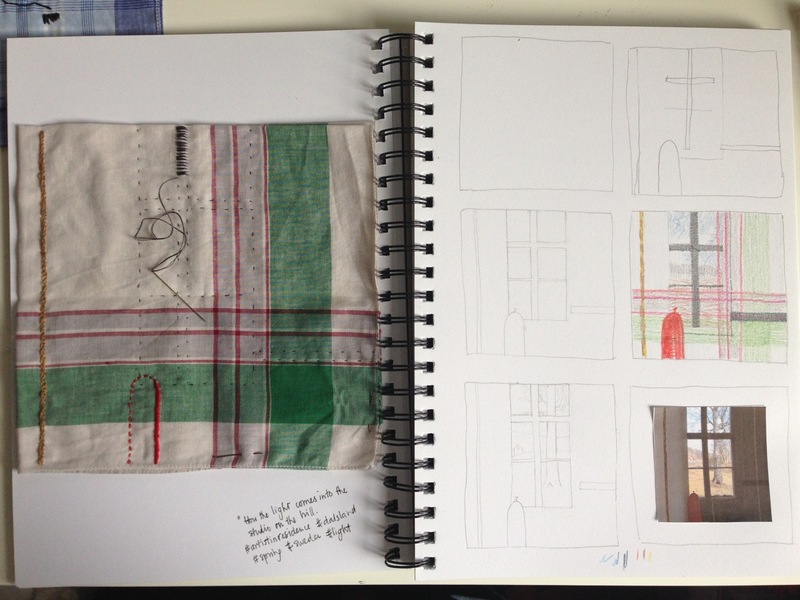 Being on the ground to collect sensations and materials gave me a means of responding to the particularities of Beverley (physical, historic, cultural) through the process of making. Studying the plan of Beverley and remaking it into a pieced map made clear how the layout of streets and railway had been decided in response to the river Avon. And as the Avon flows into the Swan so the thread of the river leads to Perth where the streets, boundaries and buildings of the city are oriented and shaped by its position on the Swan. 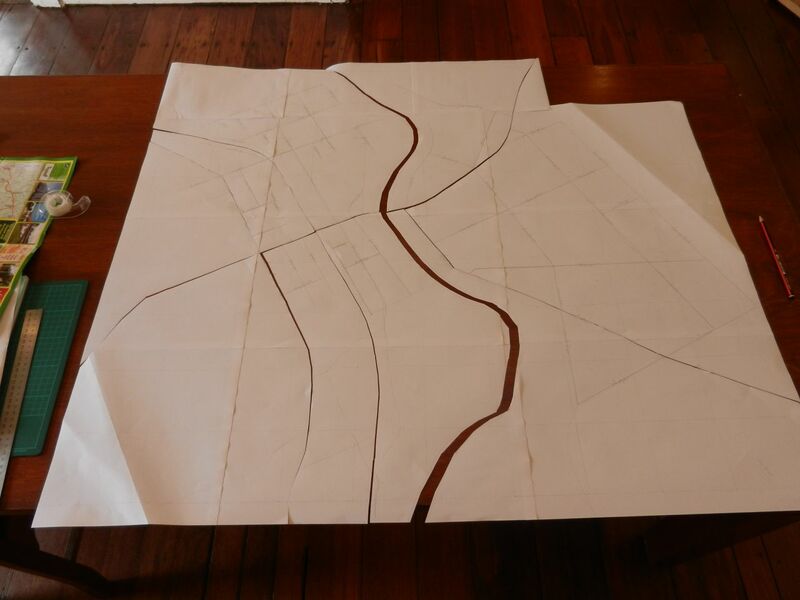 Making the Beverley map was not a culmination but a plan for thinking about the city of Perth, and beyond, for a mud map of how to approach any place I choose to observe and remake.